An archipelago in the Indian Ocean, the Seychelles are north-east of Madagascar and south-west of the Maldives. The best time to dive the Seychelles is April, October or November when the seas are calm and boats can reach the more remote spots where you will often dive with sharks and manta rays. The weather is cooler and more humid during the southeast monsoon season of late May to September. During this period the visibility is lower, however the presence of lots of plankton brings in the whale sharks. The warmest weather is during the northwest monsoon from December to March. The water is always warm, from 25 to 29 oC. Some of the best dive sites include Aldabra Atoll, Shark Bank and the Ennerdale wreck. The Seychelles comprise 115 islands. The main diving islands are Mahé, La Digue and Praslin - part of the inner island group. There are also dive centres on outer islands like Alphonse. You can also dive the Seychelles by liveaboard. Be careful around Cote D’Or beach on the island of Praslin as several robberies have been reported here recently. Medical facilities in Seychelles are limited, especially on the more remote islands where doctors are often unavailable. Take out comprehensive travel and medical insurance before you travel. If you need an ambulance dial 999. Sun screen and insect repellent are expensive in the Seychelles: bring your own supplies with you. The currency is Seychelles rupees. Other currencies are rarely accepted but some hotels may take Euros or US dollars. Credit and debit cards are widely accepted. No-one needs a visa to enter the Seychelles, just a valid passport and a return ticket. The Seychelles has agreed to designate 210,000 square kilometres of its ocean as Marine Protected Areas, limiting their use to research and regulated tourism while prohibiting harmful activities like dredging and oil prospecting. The protected areas will be rolled out in two phases. The first phase will cover the remote Aldabra Group in the outer islands. The second phase will protect 135,000 square km of deep water. "Each site has many small reef fish in abundance: oriental sweetlips, butterflies, moorish idols, little glassies, schools of fusiliers. The pelagics include tuna, barracuda and the trevally families: giant trevally, bluefin, bigeye and yellow spotted. Large schools of bumphead parrotfish are found on many sites. 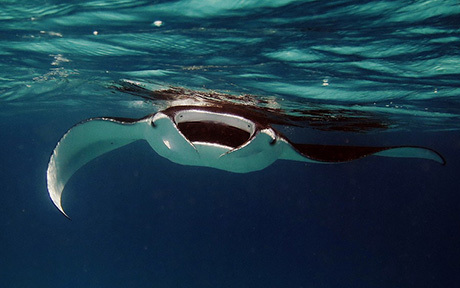 Schools of eagle rays, bat rays and large individual stingrays are seen often. Many encounters with Whalesharks have been logged during the migrating season in November. Individuals have also been encountered in April and December. There are also many sightings of green turtles and hawksbill turtles, both of which breed and nest in Seychelles. Reef sharks are a common sight at most divesites: black tip, white tip, grey reef and nurse sharks. Moray eels, geometric eels, ribbon eels, octopuses and scorpionfish are common sights." "Not as good for diving as the Maldives, but better destination if going with a non-diving partner. The diving is very easy and at certain times of the year you may see whale sharks. They allow a maximum of 2000 tourists and there are huge beaches with very few people. " 8 km northwest of Mahe. A granite plateau with massive boulders it is rich in marine life and coral. Many different tropical reef fish, grey stingrays, white tip reef sharks, schools of barracuda, Jack fish, humphead and parrotfish as well as turtles and whale sharks. A short distance from Mahe Island. The wreck lies on its side at the depth of around 25 m. It is covered by different species of corals and a plethora of fish including large shoals of yellow Snapper, pepper and snow-flake morays, stone and scorpion fish. An easy dive near the Beau Vallon dive centre. A gently sloping reef with coral formations interspersed with sand. Diving with large numbers of grey reef sharks. You'll also see large shoals of snappers, turtles and moray eels. If you own or manage a dive centre: get yourself added to our directory. Have you dived in the Seychelles? Let us know about the diving centre you used. 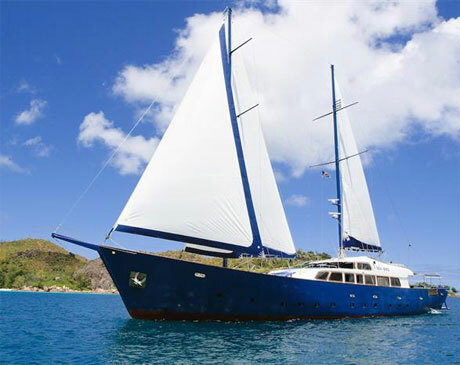 The Seychelles Liveaboards - Compare prices online. Book now & pay later. 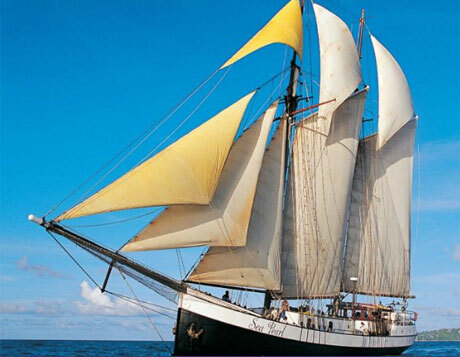 Galatea is a 30 meter long, 6.2 meter wide Turkish steel schooner, it was built in 1987 in Bodrum, Turkey. In 2010 this yacht was bought by Blue Sea Divers - a team full of Professional Divers, established in the Seychelles since 2002, transferring from Europe and chasing their dreams. The boat was fully renovated during 2012 to 2013. 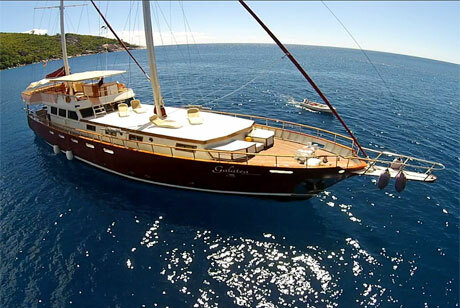 Galatea is able to accommodate 12 guests in her 7 cabins. A modern 42m long custom built yacht with 9 air-conditioned cabins all with en-suite bathrooms. A beautiful old ship built in 1915 but recently refurbished. One of the main destinations is La Digue for the reef sharks and the coral. Also visits Mahe for eagle rays, whale sharks and nurse sharks. Diving on one of the outer islands. Please send us your comments on the Seychelles. Do you want to recommend a diving centre or dive site? Let us know. If you own a dive centre get yourself added.